On May 12, Cardinals prospect, Oscar Taveras, injured his right ankle while attempting to steal second against the Fresno Grizzlies. According to a team official, Taveras was listed as day-to-day when an x-ray of the ankle came up negative. Thus, it did not look like it would be that big of a deal, and he would be back on the field in less than a week. 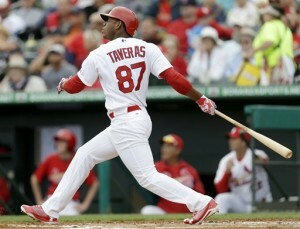 On May 26, exactly two weeks after the injury, Taveras was expected back in the lineup for the Memphis Redbirds. He had been running sprints and doing agility drills throughout the week so his return to the lineup seemed imminent. However, when game time rolled around, he was not in the lineup due to persistent soreness in his right ankle. Today, Taveras was finally placed on the disabled-list for Triple-A Memphis because of the ailing ankle. Thus, it seems that he may have been misdiagnosed on this injury or has not responded to treatment the way they had planned. For the sake of his future as the starting center fielder for the Cardinals, one hopes that he did not injure it any further while trying to get back into playing shape. Now that he is officially on the DL, it is the time for him to be reevaluated in depth before taking the next step in the process. Just yesterday, ESPN’s Keith Law named Taveras the new #1 Prospect in all of baseball. Thus, without an immediate need for the Cardinals in center field right now, they need to make sure Taveras is 100% before returning to the playing field. If all goes as planned, he will be the Cardinals starting center fielder for years to come so the team needs to deal with the situation with extreme caution. Jon Jay, who is fourth on the team in on-base percentage and is an above average fielder, is doing a fine job in center at the moment. If Jay was still struggling like he was at the beginning of the season hitting below .200, there may have been more urgency to get Taveras back on the field. However, with the high level the team is playing at right now, and the fact that Jay has turned things around as of late, it is time for Taveras to get some rest and get his right ankle back to 100%. Before the injury, Taveras got off to a slow start for Triple-A Memphis. However, his bat heated up leading to a .317 batting average with 4 home runs and 20 RBI. He showed flashes of being a star center fielder some day, but his health is the #1 priority at this time. The Cardinals offense is fine right now, and if they keep it up, Taveras may not even see the big league level until next season–plenty of time for his ankle to return to normal.